This is what you should wear on your wedding day, according to the popular rhyme. The origins of this couplet hide in the English folklore and it is believed that if you wear the four “somethings” plus the sixpence, this will bring good luck to your marriage. Symbolizing your life as a single woman prior to marriage, something old stands for your old lifestyle that should be left behind you, so that you enter your marriage without any regrets. It also represents continuity, family, and tradition, so a great way to incorporate it into your bridal style is to add to your wedding dress some elements from your mother’s wedding dress. It will mean the world to her if you honor her in this special way! Representing your new life as a married woman, something new is a symbol of your hopes and dreams that you, together with your newly-wedded husband, will turn into a beautiful reality. A great way to add “something new” to your wedding style is a piece of statement jewelry – a pair of earrings or a bracelet that you can wear on many other occasions as a married woman after your wedding! Just like you want to “borrow” the recipe for a happy marriage from a married couple who seems to have figured it all out, something borrowed symbolizes your desire to get this recipe. That’s why your something borrowed should be borrowed from a person who is very happy in their marriage. Another chance to honor the ones you love the most presents itself with “something borrowed”. You can use one of your father’s ties as a wedding bouquet wrap or ask you bigger sister (sister-in-law) to lend you her wedding veil. Don’t limit your choice to family members, though – your best friend (if she is married) will also be flattered to find out that you want to “borrow” her happiness on your wedding day! Symbolizing purity, fidelity, and love, something blue is also connected with this part of you who feels blue on this special and so important day. 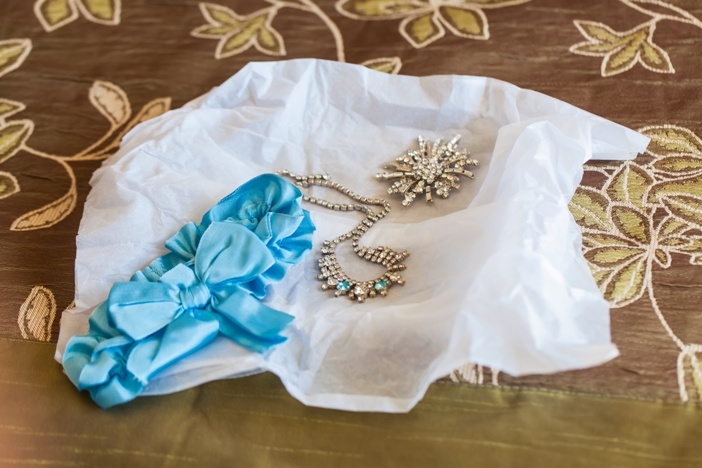 “Something blue” is usually a garter, but you have many different options to incorporate a more memorable and original blue element in your wedding style. Some creative ideas for something blue include blue jewelry, blue shoes, blue elements on your wedding manicure, a blue hair pin, blue flowers in your wedding bouquet, blue underwear, etc. There was an old tradition according to which the father of the bride would slip a silver sixpence coin in the bride’s shoe so that she and her husband would have a long, happy, and prosperous life as a married couple. These coins were in use from 1551 to 1967 and, if you’re lucky, you may even find a genuine one to tape to your sole for good luck!